Twenty five lawyers in Canada, the U.S. and overseas have notified us that they received an email from the purported Mika Kennedy looking to retain them with regards to a collecting overdue payments resulting from a separation agreement. Please i wish to file a contempt petition against my ex-spouse for breaching the court’s judgment (decree) with regards to payment of Child Support, Spousal Support, and Medical support. Please advise if you handle such case, if not please refer me. Thank you for your response to my email. I would have visited your office if I was in the states but I live in Japan while my ex spouse Louis Kennedy who is a citizen of USA lives in your jurisdiction. I and my ex spouse fell in love during His UN deployment visit to Japan 1996 and got married 23rd of May, 1997, at Kumamoto Family Court. He is a medical practitioner for the UN. Due to my hearing problem (Disability) it is diffucult to talk to you on phone, would have loved to discuss this matter on phone, but i can read and write very well. If need be it to testify in the United States i will make myself available at that time. I and my ex spouse agreed under a separation agreement incorporated, merged into and made part of the court order for a settlement of Child Support, Spouse Support and Medical Support of $918,500.00 USD he has only paid $245,600.00 January 28th,2013 but still owing $672,900.00 and the stipulated time for the completion of payment April 17th, 2013 has long elapsed. This is the reason why I contacted your firm as there is already an agreement in place. Find Attached in my ID, in PDF Court Order and Seperation Agreement. Thus, I request your firm’s legal service to enforce the court order compelling him to remit balance owed me. Kindly send me a copy of your attorney-client retainer agreement and if the terms are acceptable I will sign so we can commence the process without delay, Immediately I recieve the retainer agreement I will Sign and return. I am an attorney practicing in Queens County, New York. Thank you for this “avoidaclaim” blog regarding the separation agreement scam using the name Mika Kennedy. Please know that I was contacted yesterday by a purported client named Fumiko Anderson seeking to retain my services to collect on unpaid child support, spousal support and medical payments due under separation agreement and divorce decree from the Kumamoto Family Court. Ms. Anderson’s alleged passport, separation agreement and divorce decree were nearly identical to those posted in the blog. In fact, I would like to know how to upload the documents I received and/or add an article to your blog. Please advise. Our firm in Annapolis, Maryland received an inquiry through our website with the same email from Mika Kennedy and supporting documents. I just got the email from Mika Kennedy. I practice in Iowa. Thanks for the heads up! I received the email from Mika Kennedy today. I practice in Texas. I also appreciate your information regarding this scam. Our Wisconsin office received a similar inquiry from “Mika Kennedy” this morning. Thanks. We receive these scams 3 times per week. Different names, for some reason always Japan. Same documents provided, just different names. We are in Florida and we got an email from Mika Kennedy yesterday. We have another firm in our office and they received one as well. I just received the same “Mika Kennedy” e-mail. I have received many similar ones in the past. I am a Family Law practitioner in Commack, NY. I just received the same “Mika Kennedy” email and reply from “Mika” when we wrote back. I am a Family Law Attorney in Florida. Received exact same documents, passport and response. Yes, I got the same email. I sent her a fee agreement and she sent it back. I got suspicious when she wanted the name of my financial institution to mail the retainer fee. I don’t think I will be getting that retainer fee by cashier’s check or money order any time soon. We were solicited for the same scam here in Oregon, but the names used were Fumiko Anderson and Bill Anderson, the amounts involved were slightly different, and it was a request for registration and enforcement of a foreign judgment rather than a contempt proceeding. It was also a purported “Kumamoto Family Court” order. Thanks for the information. I’m an attorney in Southern California. I received the same emails, and attached documents, recently. Upon receipt of the initial email, I responded that I would need some additional information, whereupon I received an email indicating that some of the information I was requesting was of a ‘confidential’ nature, but the email did confirm that Mr. Kennedy lived in Orange, California and worked for the UN as a medical technician — amazing how Mika convinced him to sign a settlement agreement to pay over $1 million in support, in two payments to be made in 2013. I think I’m going to apply to the UN for a job! Just received the same with name Fumiko Anderson. Thanks for the alert, I just received this e-mail, word for word, and thought it was suspicious. I received the Fumiko Anderson and Hitomi Jefferson scams. The fact that they were nearly identical caused me to check them out and avoid additional trouble. Our firm received a very similar inquiry via our website earlier today. It was from Kennedy Mika, rather than Mika Kennedy – Same request about filing a contempt against ex-spouse for failure to make court ordered payments of Child Support, Spousal Support and Medical support. Mika Kennedy apparently needs a lawyer in Decatur Illinois to collect support. Poor woman apparently has a ton of deadbeat ex-husbands throughout the US. Good thing she is not handling these matters herself from Japan and instead is seeking the aid of qualified local counsel! That ought to read: “Mika” Kennedy is a busy “person.” She us now seeking representation in Connecticut. I just received two emails from her. Thanks for this website!! I got the initial Mika Kennedy email. I sent a retainer agreement. I received a signed retainer agreement via email with a request that I not contact Brian Kennedy and just wait for the delinquent payment and if it’s not received in 7 days, I was expected to move forward full force to collect. Within 3 days, I received the check and was expected to deposit the check in my IOLTA account. It all moved very quickly and is done very professionally. This person, whom I suspected to be a scammer, is now using the name Maki Kennedy, all with seemingly legitimate documentation (but not convincing). Although I replied to her detailed email (content identical to that posted), I have no intention of doing anything for this [fictitious] person. But I do want to help forewarn others who will be contacted. This initial contact actually came to me from my colleague, who forwarded it to me. You can frame it or destroy it! 4. The amount of the total judgment for child support, alimony and medical support was very, very high, over $1,000,000. We also researched Jon Stryker and found no such person listed as a surgeon for the United Nations. The only Jon Stryker we found on the internet is a billionaire/philanthropist. I received the same email and documents from Mako Kennedy, whose ex is Brian Kennedy. I practice in San Diego County, CA. I suspected a scam, and I’m very happy that I found this website to confirm it. Thanks! I am living and practicing in Toulouse, South France, and I received an enquiry from Mike KENNEDY yesterday. I also confirm that I am receiving scams like this at least once or twice per week and lately from Japon! That is the reason why I checked on google and that is how I found your site. Thank you for your interest in my case. I would have loved to schedule an appointment to come over to your office for consultation but i am not currently in the states, i am currently residing in Japan while my ex spouse Brian Kennedy who is a US Citizen lives in your jurisdiction. I and my ex spouse fell in love during His UN deployment visit to Japan 1996 and got married 23rd of May, 1997, at Kumamoto Family Court. My ex spouse Brian Kennedy is a medical practitioner for the United Nations. Due to my hearing problem (Disability) it is difficult to talk to you on phone, would have loved to discuss this matter on phone, but i can read and write very well. If need be it to testify in the United States i will make myself available at that time. Myself and my ex spouse agreed under a separation agreement incorporated, merged into and made part of the court order for a settlement of Child Support, Spouse Support and Medical Support of $918,500.00 USD he has only paid $245,600.00 January 28th, 2013 but still owing $672,900.00 and the stipulated time for the completion of payment April 17th, 2013 has long elapsed. I am also aware that your jurisdiction can enforce a foreign judgment. I am contacting your firm due to the fact that there is already an agreement in place and a court order. For your review i have attached document you will find my ID, in PDF the Court Order and Separation Agreement. I request your firms legal service to enforce the court order compelling him to remit balance owed to me. For my review i request your attorney-client retainer agreement and if the terms are acceptable I will sign so we can commence the process as soon as possible. Immediately I receive the retainer agreement I will Sign and return to your office. 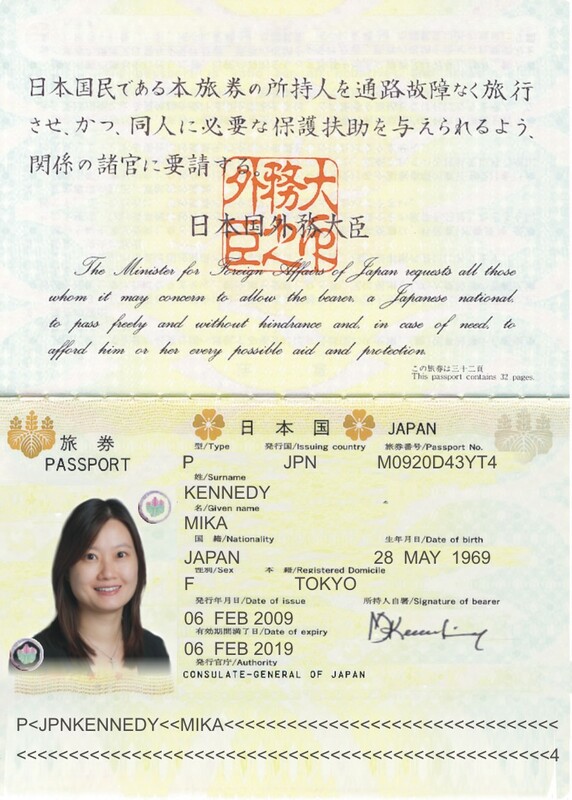 “I would have loved to schedule an appointment to come over to your office for consultation but i am not currently in the united states, i live in Japan and my ex spouse Brian Kennedy who is an american Citizen lives in your jurisdiction. I and my ex spouse fell in love during His UN deployment visit to Japan 1996 and got married 23rd of May, 1997, at Kumamoto Family Court. My ex spouse is a medical practitioner for the United Nations. I would prefare email communication as i am always busy. Let me know the best time to call you. I and my ex spouse agreed under a separation agreement incorporated, merged into and made part of the court order for a settlement of Child Support, Spouse Support and Medical Support of $918,500.00 USD he has only paid $245,600.00 January 28th, 2013 but still owing $672,900.00 and the stipulated time for the completion of payment April 17th, 2013 has long elapsed. I am also aware that your jurisdiction can enforce a foreign judgment. I am contacting your firm due to the fact that there is already an agreement in place and a court order. For your review i have attached document you will find in PDF the Court Order and Separation Agreement. I request your firms legal service to enforce the court order compelling him to remit balance owed to me. For my review i request your attorney-client retainer agreement and if the terms are acceptable I will sign so we can commence the process as soon as possible. Immediately I receive the retainer agreement I will Sign and return to your office. I received a similar email just like the above, from some one who calls herself Mika Kennedy, claiming same facts as the above. But I decided to respond asking her to provide more information and then she sent me what she called a copy of judgment and some other document. While I thought about it, I decided to Google the court she mentioned in her papers, I noticed others had commented on her and I ignored the her. Thx sharing the information earlier. “She” is still at it. We just got a contact form submission from our website from Mika Kennedy. 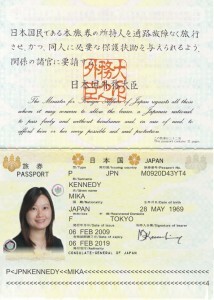 “She” sent us the pictured passport, “decree” from Japan, etc. We’re in Arizona. This is the reason why I contacted you as there is already an agreement in place. Thus, I request your legal service to enforce the court order compelling him to remit balance owed me. Kindly send me a copy of your retainer and if the terms are acceptable I will sign so we can commence the process without delay. SEND ME THE RETAINER AGREEMENT. Thank you. You have answered my questions. Again thank you, now I do not have to wonder if this was a “real” solicitation. Got one today from Stacy Kross seeking to collect from Kennedy Kross “a medical examiner for the UN. Now claiming the divorce agreement was adopted and approved by the court in Dallas County. Clearly bogus BS. Stacy Kross contacted our law firm and asked us to handle a post decree case. She claimed that her husband owe her money and she needs it to get surgery. She sent my firm a Cashiers Check from Regions bank that looks very real. The check amount is 225,000. She told me to deduct my retainer out and to send her the rest for her surgery asap. I did not send any thing nor did I deposit the check. I immediately went on line to search the scam. It turns out that other attorneys have gotten contacted from Stacy Kross. She or he or who ever it is has been trying the same thing in Tennessee for a while as well. Her latest is she goes by the name Rhoda Kennedy and she has changed the names of the parties and the childrens’ names, but not the birth dates or the case number. Whoever is sending these has reached out to Idaho, as well. The first email received “felt” suspicious and is nearly the same as the one you provided above. I had responded with a generic reply, then received the second email–again, similar to the other one you provided. Thank you for confirming this is a scam. Rhoda Kennedy has contacted our office in Nebraska. Her first email was generic enough, but her response email sent out warning bells. Documents have the same case number, dates of birth for the children & signatures. Did change the children’s names & parties names. Funny that Rhoda Kennedy has the exact same signature as Mika. Just got the Stacy Kross email now — it smelled fishy but this webpage was a life saver!!! Mika Kennedy scam is still ongoing. I am an attorney in Manhattan and I received an email from Mika Kennedy through Justia.com a couple of days ago. It seemed suspicious so I googled her name and found this site where my suspicions were confirmed. I will be forwarding it to the appropriate legal authorities. Thank you everyone for altering others to this scam. Got the Mika Kennedy e-mail yesterday – Madison Wisconsin. Wow. Was contacted in February and immediately suspected a fraud. However, I enjoy playing these through to see how sophisticated the fraudsters are. After only a week of emails, I received a “check” yesterday for $295,000! It looks and feels authentic but was drawn on unrelated business account of a real business! Bank was fishy and had no real touting number etc. So everyone, these are sophisticated but there are certainly red flags if you are diligent.